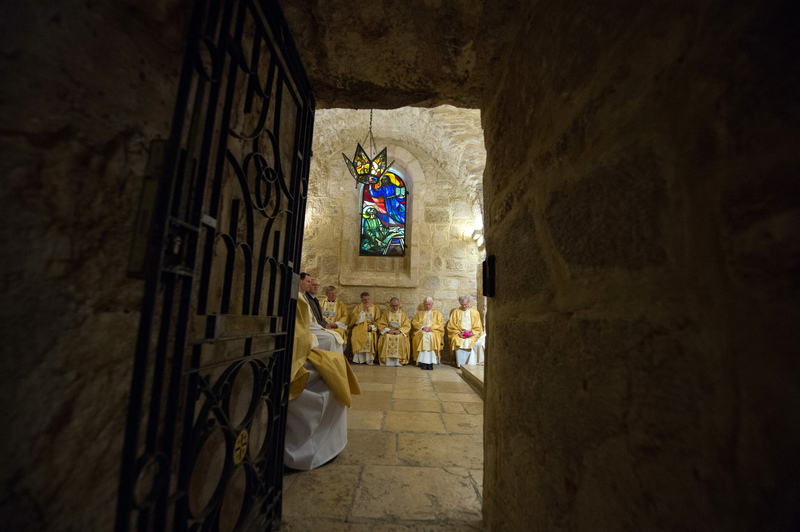 Bishops participating in the annual Holy Land Coordination see "great need" to promote an understanding between Israelis and Palestinians, said Bishop Noel Treanor of Down and Connor, Ireland. "There is ... a need to devise ways for both people to understand that, ultimately and finally, for the common good of all, a permanent and sustainable solution is needed," said Bishop Treanor. "The kind of issues at stake here are not easily resolved, but some kind of solution has to be found. It is difficult to know when that will be achieved." "It does not make sense that people living in such close proximity should be a source of conflict," he added. "The kind of problems faced here ... are part of the human condition," Bishop Treanor said. "An emphasis must be on the role of the international community. The world has become more interdependent ... and the international community must be involved so that people may live in peace and harmony." The annual Holy Land Coordination includes bishops from North America, Europe and South Africa. Based this year in the northern Israeli city of Haifa 12-17 January, it has focused on the challenges and opportunities for Christians in Israel. The bishops visited Christian hospitals, schools and villages in Israel. They also met with Christian religious leaders, Christian mayors from Israeli towns, members of the Israeli Knesset, academics and internal refugees from the Melkite Catholic village of Ikrit. The diverse meetings have helped highlight the "incomprehensible complexity" of the situation, said Bishop Treanor. "We have also seen people working for peace and justice and the promotion of mutual understanding. Those are the ingredients for a sustainable solution and hope," he said. On 13 January, the bishops celebrated Mass at the Church of the Visitation in the northern Palestinian village of Zababdeh and visited the Jenin refugee camp and a school run by the UN Relief and Works Agency for Palestine. The school has been adversely affected by the US government's withholding of funds to UNRWA, noted Archbishop Timothy Broglio, chairman of the US Conference of Catholic Bishops' Committee on International Justice and Peace. "The cutoff of USA aid is a very aggravating factor, which makes life more difficult," he said, noting that class sizes have increased to about 45 students per classroom and job training and job promotion programs had to be closed. "Those are innocent people caught in a battle." "They are Israeli citizens and do form a bridge. They can be loyal members of Israel as well as loyal members of our faith tradition," he said. Archbishop Broglio said that while Christians in Israel have opportunities, they also face challenges and discrimination such as the newly passed Nation State Law, which recognises Israel as "the national home of the Jewish people." Opponents say the law reduces non-Jews to second-class citizens. The bishops' visit also inspires hope in the local Christian community that people abroad care about them and that will advocate for them to their governments. "We know and understand the difficult circumstances in which you live, and we also understand the important vocation you have of keeping the flame of Christianity alight in the place of the Messiah's birth, ministry, death and resurrection," he said. "The promotion of truth, love, justice and peace are integral to the mission of the church. In the presence of untruth, injustice, hatred and violence we cannot remain silent. We have an obligation to witness to the kingdom. We cannot be silent, nor can we be neutral," he said.